A fairly early start today but now we are not bombarded with door banging all night, we can cope. We form part of ‘Red 3’ and leave Harbour 39, Melkinlaituri, for a tour to Porvoo, with guide Reila. Over 10% of Finland’s population live in the capital but Helsinki is in shut-down as it is the middle of the two and a half month school summer holidays and most people have left for their summer chalets by the 188,000 Finnish lakes. Many of Helsinki’s buildings date from 1895-1915 and are Art Nouveau in style. There are many parks in Helsinki and we see the 1952 Olympic Stadium. Helsinki was founded by King Gustavus Vasa of Sweden to rival Hanseatic Tallinn. After Swedish rule, Finland became annexed to Russia as an autonomous Grand Duchy in 1809, finally gaining independence in 1917. This was followed by a civil war in Finland, between the red and white armies. In 1939 the Russians declared war on Finland. Although Finland lost, they were allowed to keep their independence, in return for some territory and reparations. The remaining map of Finland resembles a woman with an outstretched hand, so the country is known as ‘the daughter of the Baltic.’ Languages are key to a Finnish education and the constitution specifies four official languages, the linguistically unusual Finnish, Swedish, Sami and sign language. Finnish, Swedish and English are all compulsory from the earliest stages of schooling and an fourth language is added at high school level. For 5% of the population, Swedish is their first language, so signs are normally in Finnish and Swedish, similar to signs in Wales. Although church going is not particularly common, three-quarters of the population consider themselves to be Lutherans and a further 1% Russian Orthodox. A tax of 1% is automatically deducted from pay and given to the designated church. Those who choose to save on the tax and align themselves to neither religion are not entitled to marriage or burial in the churches. Two thirds of Finland is forested and related industries are important. Between 30,000 and 60,000 moose are culled each year. Other wildlife include lynx and, in the east, grizzly bear. This year is the coldest summer for fifty years but it is another lovely day as we drive for about an hour east of Helsinki to the medieval town of Porvoo. It is compulsory to drive with lights on at all times and winter tyres must be used in season. Schools are never closed because of snow as road-clearing schemes are so good in bad weather. 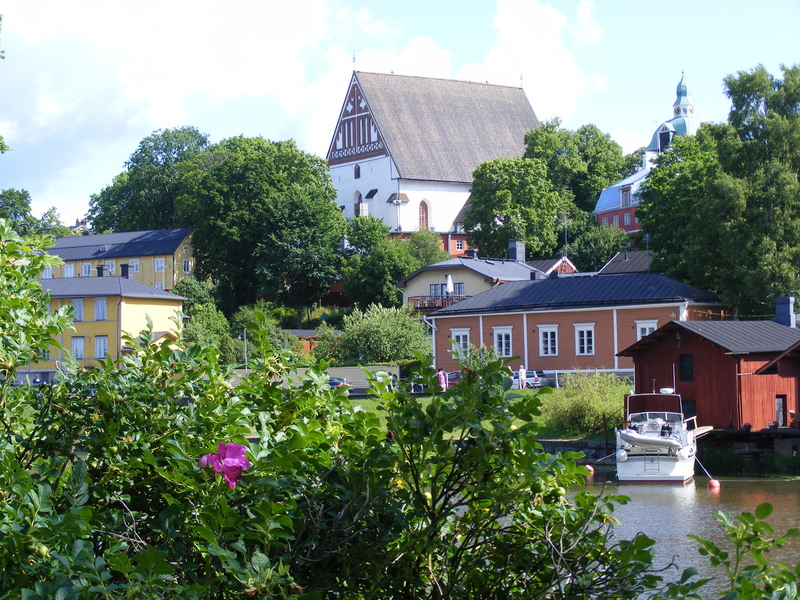 There are 800 wooden buildings in old Porvoo and these are highly desirable and rarely come on the open market. In 1760 200 of Porvoo’s then 293 wooden houses were destroyed in a fire when a cooking pan of fish soup was left unattended. The cobbled streets of Porvoo are reminiscent of Clovelly, although here cars are allowed. We see the Old Town Hall in the Town Square. This dates from 1764, although the tower is later. The Cathedral was built in the 1450s, on the site of an earlier church. It was granted cathedral status in 1723 and restored following a fire in 2006. The wooden shingles on the steep roof are tarred to help preserve them. Fire was a continual hazard and there is a watch tower by the side of the fire station. In Mannerheiminkatu are the old wharves, where dried fish and furs were traded. Next we are off to a farm, whose name translates as ‘Clay River’. There has been a farm here since 1450 and twenty seven members of the same family currently live on site, where they run an equestrian establishment and riding school. They swapped from dairy farming in 1963, when the butter mountain meant that the government ordered the sale of cows. Their dairy herd was ‘sold’ to Russia but they received not money but horses in exchange. We see some of the farm’s horses, which are sold throughout Europe, primarily for dressage. Each horse has to be taught to respond to commands in the appropriate language before sale. This will be useful. My experience of riding a Finnish horse told me that what I thought was stop, was in fact ‘hurry up’. We then have lunch in the farm house. Although the menu does not sound too appealing I decide I should be sampling local cuisine so tuck in to stinging nettle and fish soup, some other kind of fish dish, accompanied by very salty vegetables and cake and berries. We head back to Helsinki and learn more about life in Finland, where sauna culture is key. Who knew that sauna (sore-na in the UK) is here pronounced ‘sow (as in female pig) na’? It is normal to remove shoes on entering a Finnish home. In the 1600s tar was an important export. In the 1640s the population of Helsinki was only 300-400 but it began to grow in the 1750s when the fortress was built. There are 330 islands front of Helsinki. All the ports freeze in winter and are kept open by eight ice-breakers. A special area is set aside for the washing of carpets and this is still done. We stop at the Rock Church, which was blasted into the rock in 1969 and has an impressive copper roof. It seems a shame that this is a tourist attraction, and no longer feels like a place of worship. We stop off in the Senate Square and visit the market place. After more informal dining, our evening talk is Helen Smith on researching your health history. Getting lots of chuckles from your stories! I found the church tax very interesting., and unusual. The tax applied in Sweden and Finland – I can’t see other countries adopting it but I guess if it has always been there people just accept it.